What is important when selecting coat hanging equipment such as coat trees, wall mounted coat racks, wall mounted shelving, coat hangers, wall mounted coat hooks, and wardrobe racks? Capacity needs will shape what type of coat hanging equipment will be optimal for your facility and how many units you will need. In most cases, floor standing coat trees, wall mounted coat racks or a combination of both will meet your capacity demands. Each has unique benefits. Coat trees are an excellent choice because they require no installation, are portable, fit into corners and between chairs, and, work very well in smaller spaces. Multi-functional “combination” units are available through top USA manufacturers. 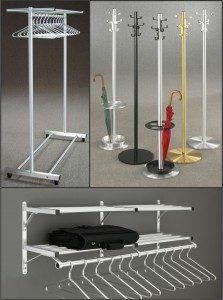 For example, Glaro Inc. now offers coat trees with a hanger bar or hooks, umbrella stands, and some are complete with matching solid aluminum hangers. These combination coat tree/umbrella stands are available in various configurations and finishes. By contrast, using a wall mounted coat rack is an excellent way to keep coats well organized and accessible without taking up floor space. They are easy to assemble and mount. Wall mounted coat racks are also modular. Interlocking sections can be added as needed to increase capacity as needs increase. For example, Glaro wall mounted coat racks are composed of 24”, 30”, and 36” modular sections that easily interconnect to create longer lengths. Wall mounted coat racks optimize the use of vertical space to maximize storage because these racks include one or two shelves depending on the model selected. If durability is important, then you should consider the difference between wood, plastic and all metal construction. Aluminum coat hanging equipment is known for its quality, consistency, and longevity. Imported coat hanging products—often made of painted steel, wood and plastic—are generally more cheaply made and therefore may not last as long. They may also lack the sophisticated design and finishes seen in American made products. The design and finish of coat hanging equipment should be carefully selected. It’s important to choose a design and finish that will look good over the product’s lifetime. Metal products are timeless and they present a high end look that does not go out of style. Aluminum, when satin polished, is a very popular choice because the finish does not tarnish or rust. “Natural” wood and plastic designs do exist in the market; however, they may not meet building fire codes. Avoid ‘cheaply’ produced coat hanging equipment that will need to be replaced. Products that are built to last are more economical. The quality of products placed into a facility also reflects on the facility’s commitment to visitors as well as its overall image. These “intangibles” as well as the building’s interior design should be considered carefully. Pick your manufacturer carefully. An American manufacturer has control over quality throughout the manufacturing and shipping process and is the optimal choice, especially when products need to be shipped quickly. For example, Glaro Inc. ships products in two to three days, on average. Most products are already in stock. Glaro Inc., for example, was also the first manufacturer of coat trees after World War II, utilizing aluminum tubing rather than wood. It’s important to choose a manufacturer with this level of efficiency, experience, and reputation. We hope these tips will help you in your search for the best coat hanging equipment.